Rapnews.co.uk Rapnews.co.uk UK rap, grime and hiphop culture resource! » Blog Archive » Concert Tickets Giveaway! 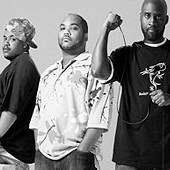 Meanfiddler have kindly given us five pairs of tickets to the De La Soul, Doc Brown and Quantic Soul Orchestra gig at The Forum, Kentish Town on Thursday the 19th of May. Doc Brown recently released his debut album to much critical acclaim. What was it called? Winners will be chosen at random and notified on the 11th. If you’re not lucky this time, check the Meanfiddler website and pick up a ticket because it sounds like it’s gonna be an awesome night! De La Soul are here in support of their forthcoming album ‘The Grind Date’, their first record for new label Sanctuary Urban which features MF Doom, Common, Ghostface and Madlib. COMPETITION CLOSED. LUCKY WINNERS: PIDGEON, DAN, JOHN, NIK AND CORIN. HAVE FUN!